This process allows users to manage all the Materials/items purchased, manufactured, sold, or kept in stock. 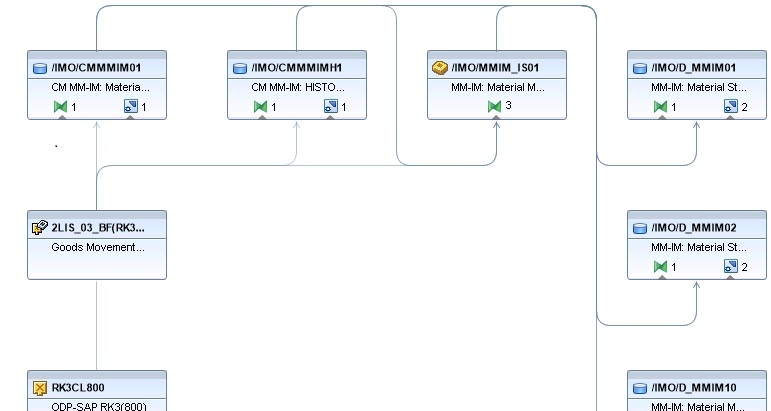 For each Material/item, users enter the data relevant for a particular area in the system. This data is used automatically by the system for purchasing, sales, production, inventory management, accounting and etc. It provides optimum support for business. Helps create orders, delivery notes, and outgoing invoices, automatically calculating prices, sales units, and gross profit. Enables complete control over stock quantities at all times and lets users analyze the financial aspects of stockholding at the same time. Allows users to control production on the basis of the items that are used for production and on the basis of the finished product and any by-products created. 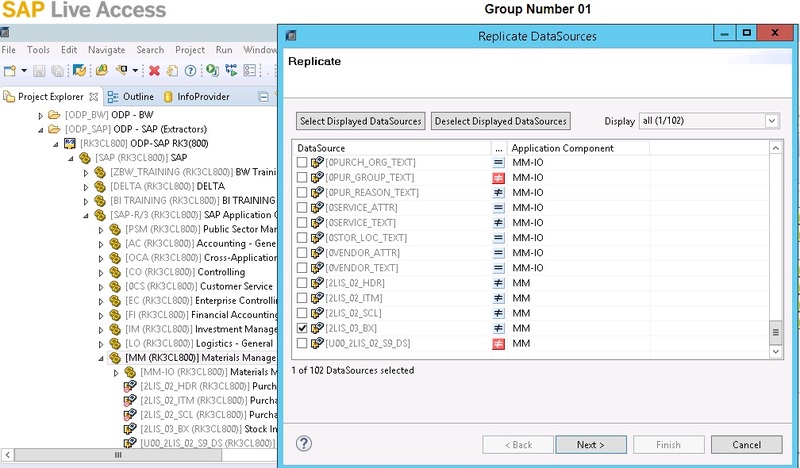 Replicate the 2LIS_03_BX in SAP HANA studio as shown below. 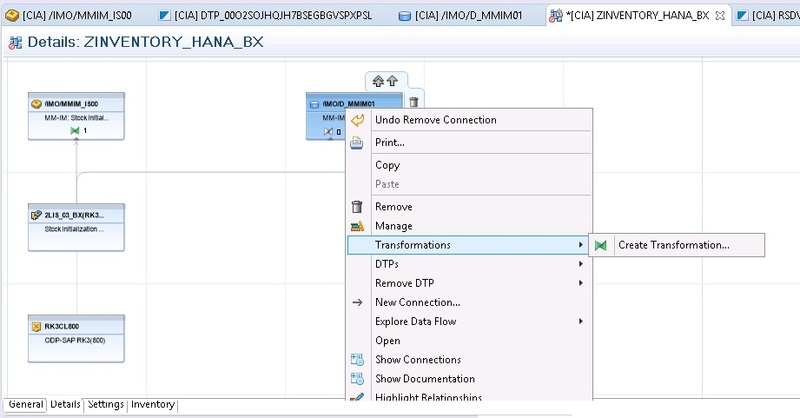 As per data flow below, Install the Infosource – /IMO/MMIM_IS00 and ADSO from Business content using RSA1 transaction from BW4 HANA system. We have all 3 layers to create the dataflow. First we will create an info area in HANA studio. Right click on any user - New  Click Create Info area  give description and Finsih. 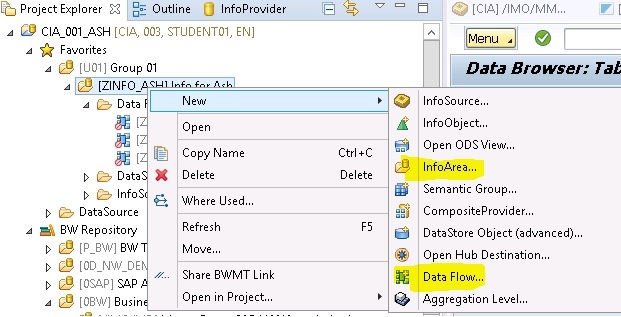 Create the dataflow as shown below. Datasource – 2LIS_03_BX datasource which we replicated earlier. Infosource – /IMO/MMIM_IS00 which we installed from Business content. ADSO – /IMO/D_MMIM01 which we installed from Business Content. 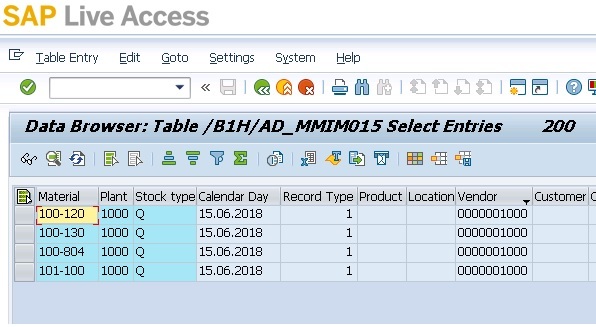 Create Transformation between infosource and ADSO shown below, this will open a GUI from HANA studio, where you can perform mapping and add business logic in start/end routine. Then activate. Right Click on ADSO – /IMO/D_MMIM01 —Create Transformation. 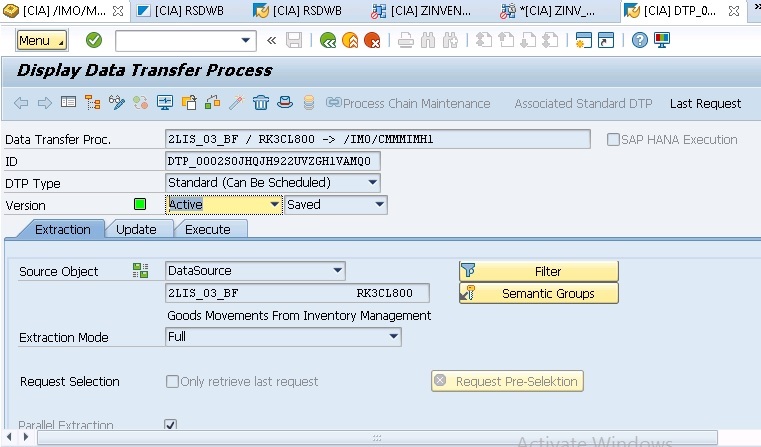 Right Click on ADSO – /IMO/D_MMIM01 - DTP’s  Create DTP  With the removal of PSAs and InfoPackages in BW/4HANA, DTPs are used for the initial load into advanced DSOs.  To load data from 2LIS_03_BX, which is a onetime load, it is imperative to select the Extraction Mode as “Initial Non-Cumulative for Non-Cumulative Values” in the DTP. To load historical movements i.e. those stock changes that occurred before the initialization. Load the DTP from 2LIS_03_BF to /IMO/CMMMIMH1 with Full according to your selection criteria. 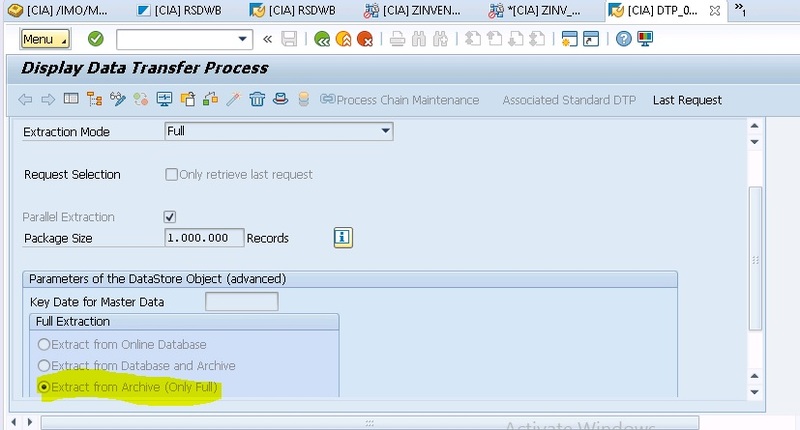 Now when we loading data from corportate memory to EDW ADSO, we need to select below check box to update stock. 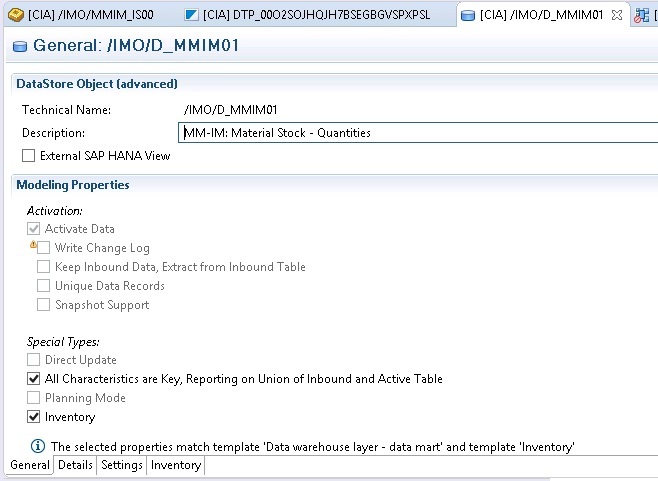 (/IMO/V_MMIM01) Install Composite provider from business content and use below ADSO’s in HANA studio. This Composite Provider enables you to evaluate stock quantities, stock values and material movements from SAP ERP Central Component (SAP ECC). I have few questions on this. Does infopackages are removed for good? 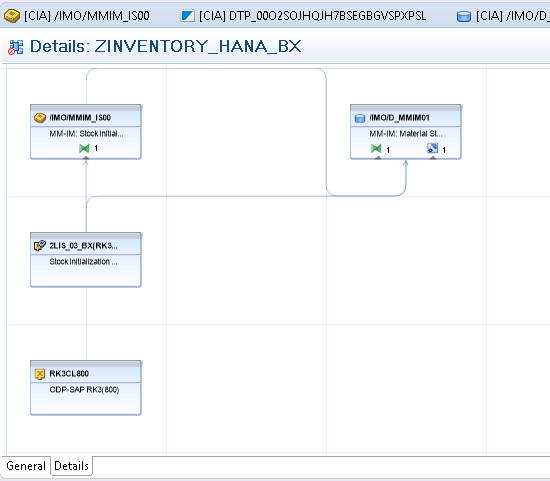 Yes there is no Infopack concept in BW4/HANA. All the historic transactions has been pushed down to DTP level. Once we select the check box mentioned in above blog saying that Extract from Archive, for Full loads from BF, this won’t update any balances, so no compression and marker update required. Very helpful. I have a question. 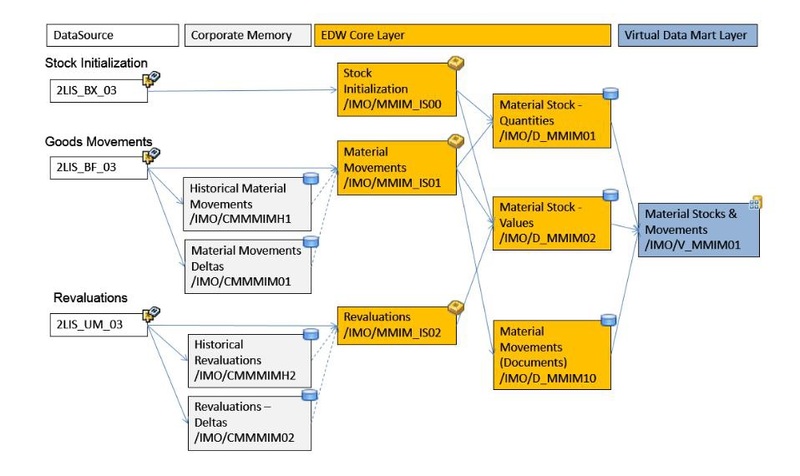 How does corporate memory helps us in entire data flow instead of storing data multiple times? Data modeling is now more leaned towards LSA++. The corporate memory contains the complete history of the loaded data. This displays an intermediate layer. 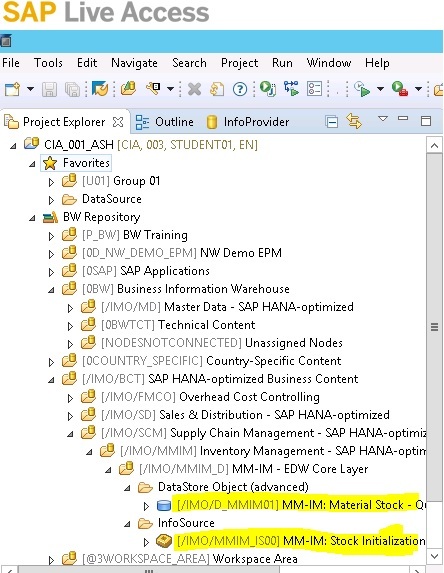 The data is posted to other DataStore objects (advanced) that serve as architected data marts. It is filled separately from the update in the architected data marts. 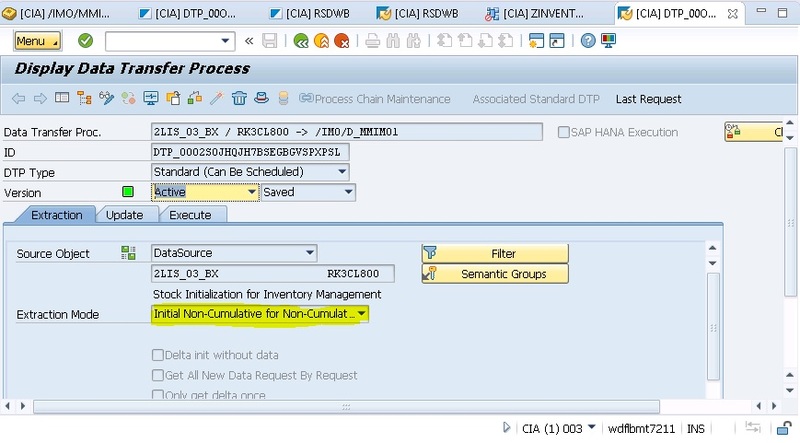 Very interesting blog on Inventory Management in SAP BW4/HANA. How to differentiate the cumulative and Non cumulative and initial stock balances in ADSo ? You need to select Inventory selection check box in ADSO settings to add Non cumulative keyfigures. For advanced DSOs, reference points contain the initialization records.Reference points are updated whenever a request with delta movements is activated. In other words, reference points are the stock values of the initialization plus/minus those of all activated requests with delta movements. 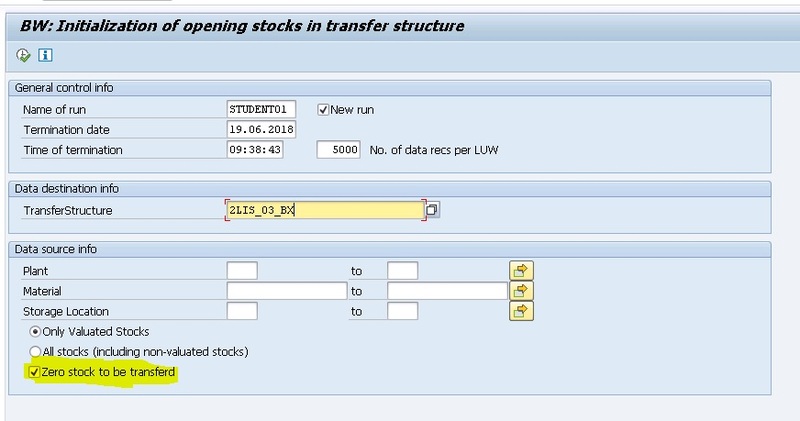 So, is it like stock initialization data can’t be seen in movement DSO and it will always be present in the reference table only and BW will consider the reference table.